First lady Michelle Obama sought to energize her husband's Virginia supporters Thursday by emphasizing the state's importance in the presidential election. “All the hard work, all the progress we've made, it's all on the line,” Obama told several hundred people who packed a downtown Richmond theater. “It could all come down to what happens in a few battleground states like Virginia,” she said. That's what happened four years ago, when Barack Obama became the first Democratic presidential candidate to carry Virginia since 1964. The first lady urged the Richmond crowd not to be misled by Obama's 235,000-vote margin of victory in Virginia, noting that it works out to only about 100 votes per precinct. “It could be a couple of votes in your neighborhood, a single vote in your apartment building,” she said in urging supporters to get their friends and neighbors to the polls. Her nearly half-hour speech touched on familiar campaign themes as she touted the president's record on job creation, health care reform, women's issues and other matters. On a more somber note, Obama said her family's hearts and prayers were with the families of the four people killed in the attack on the U.S. embassy in Libya. She said that “those brave Americans who died in that tragedy and men and women just like them, they are the face of American diplomacy” and they often do their work in harm's way. Pamela Henderson, a 49-year-old Navy veteran who now works in consumer electronics, wore a Michelle Obama button and was beaming as the crowd streamed out after the speech. “She fills our heart with joy,” Henderson said, adding that she believes the president is working hard to get the economy on track. Jeannea Spence, a Richmond leadership coach, was among about a dozen neighborhood team leaders for Obama who met personally with the first lady before the speech. “She's warm and personable, genuine, passionate and cares about everybody, but especially about the volunteers,” said Spence, who had not met the first lady before Thursday. 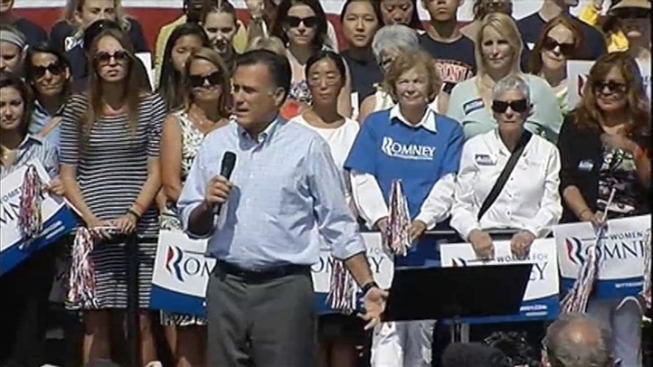 Republican presidential candidate Mitt Romney joined in the almost universal condemnation of Akin's remarks and said the congressman should drop his campaign for the U.S. Senate.